Chūgoku (中国) is the westernmost part of the main Japanese island Honshu. Aside from Hiroshima, most of Chugoku is probably well off the beaten track for a brief visit to Japan; but if time permits, you'll find a region full of memorable sights and experiences, and a side of Japan that's completely unlike the better-known destinations in Kansai and Kanto. Beyond the atomic bomb and the unforgettable Peace Memorial Park, there's also the lovely island of Miyajima, and busy lanes of traffic by sea to Shikoku and the Seto Inland Sea. The region's easternmost prefecture features a bustling capital in Okayama and a wealth of old, charming merchant quarters. Gateway to Kyushu and exchange with South Korea and China, with scenes of major influence on Japanese history. Known mainly for the enigmatic sand dunes of its capital city, a popular climbing destination at Mt. Daisen, and a long coastline. The second least populous prefecture in Japan also has its second holiest Shinto shrine and one of its few remaining original castles. Hiroshima - site of the infamous atomic bomb attack. Izumo - Home to the great Izumo Shrine, the second most holy Shinto Shrine in Japan. Kurashiki - site of one of Japan's largest and most beautiful historic areas, the Bikan Historic District, as well as the famous Ohara Museum of Art, which is full of famous works from Europe. Okayama - featuring Korakuen Garden, one of Japan's Top 3 gardens and the brooding black Okayama Castle. Shimonoseki - gateway to Kyushu and the Kanmon Straits, best known for turning poisonous fish into gourmet meals. Tottori - Home to Japan's only sand dunes, the Tottori Sand Dunes provide visitors with a highly unique experience, including camel rides. Yamaguchi - a city with many well-preserved temples. Akiyoshidai - has the largest plateau and cave in Japan. Bizen - home to Japan's oldest and most respected style of pottery. Daisen - climbers flock to the beautiful Mount Daisen. Iwakuni - a town with the picturesque Kintai-kyo Bridge. Miyajima - Location of Itsukushima Shrine, the most photographed shrine in all of Japan. Iwami Ginzan - Silver mines, registered as a UNESCO World Heritage Site. Onomichi - hillside town with pleasant paths connecting dozens of small temples. Takahashi - a quaint town most famous for Bitchu Matsuyama Castle. Tsuyama - a relaxed town famous for the thousands of cherry blossoms around its castle ruins in Kakuzan Park. 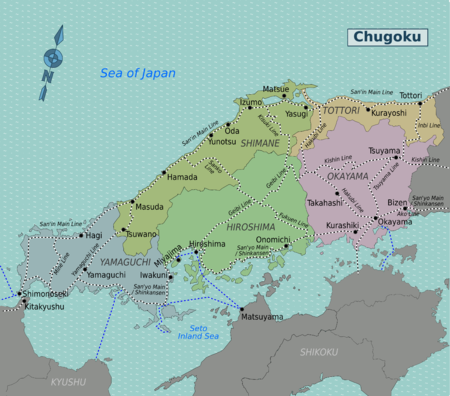 The name Chūgoku literally means "Middle Country", the sole surviving relic of a historical division of Japan into "Near Countries" (近国 Kingoku), "Middle Countries" and "Far Countries" (遠国 Ongoku), based on distance from the capital Kyoto. 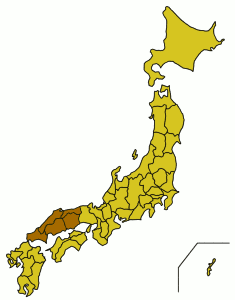 Strictly speaking, today's Chugoku covers only the Middle Countries along the San'indo and San'yodo roads, and hence Okayama is sometimes not considered a full part of Chugoku, as only three of its five component provinces (Mimasaka, Bizen and Bitchu) were Middle Countries. In Japanese, the characters 中国 and the reading Chūgoku are also used to mean "China". (The same characters are used in Chinese, but pronounced Zhongguo.) However, as the Chugoku region is always referred to with the qualifier "-chihō" and the People's Republic of China and Republic of China can be referenced by their full names, there is usually little scope for confusion. Hiroshima, Okayama, and Yonago offer both domestic and international connections with other cities in Asia. Izumo, Masuda, Yamaguchi, and Tottori each offer domestic flights. The San'yo Shinkansen line links Hiroshima, Okayama and other major towns to Kyushu in the southwest and Kansai (Osaka) to the east. The less populated northern Japan Sea coast is served by ordinary train services. The Kanpu ferry to Pusan in South Korea regularly. The Orient ferry to Qingdao in China regularly. The Orient ferry to Shanghai in China regularly. The JR West San'yo Area Pass  allows unlimited travel along the San'yo Shinkansen and San'yo main line west of Osaka, including the Shinkansen (even Nozomi and Mizuho trains). The 4-day/8-day pass is ¥20,000/30,000. An enhanced version of this pass, the San'yo-Shikoku-Kyushu Pass , also includes travel to Shikoku and all or part of Kyushu. 5-day consecutive passes range from ¥22-25,000. Iwami Ginzan Silver Mine and Its Cultural Landscape (Oda) - Registered as a World Heritage Site in 2007. Hiroshima Peace Memorial (Genbaku Dome) (Hiroshima) - Registered as a World Heritage Site in 1996. Itsukushima Shrine (Miyajima) - Registered as a World Heritage Site in 1996. Bitchu Matsuyama Castle (Takahashi) - Japan's highest castle. Matsue Castle(Matsue) - One of Japan's few black castles. Korakuen Garden (Okayama) This is the most famous garden in the Chugoku region, as well as one of the top three gardens in all of Japan. RSK Rose Garden (Okayama) A large garden containing a wide variety of roses from all over the world. Shurakuen Garden (Tsuyama) A beautiful 17th century garden with no entry fee. Adachi Museum of Art (Yasugi) Although there is a museum displaying over 1,000 works of art, the highlight of the museum for many is not the museum; it's the garden. Constructed in 1980, the garden is quite new but what it lacks in history it makes up for in size and beauty. This garden has been voted the best garden in Japan by the American Journal of Japanese Gardening. Vogel Park (Matsue) One of the largest greenhouses in the world, as well as an aviary. Yuushien Garden (Matsue) Built for beauty in every season, including winter when the camellia's bloom. Enchoen Chinese Garden (Yurihama) One of the largest Chinese gardens in Japan. Enchoen was first built in China, disassembled, and then rebuilt in Yurihama as a symbol of friendship between Tottori and China's Hebei Province. Tulip Fields (Hiezu) A garden full of beautiful red and yellow tulips. Shukkeien Garden (Hiroshima) An impressive garden built by Ueda Soko, considered to be one of the greatest masters of the tea ceremony. Sesshutei Garden (Yamaguchi) This garden is a reproduction of a scene from one of Sesshu's most famous landscape paintings. Chōfu Garden (Shimonoseki) One of the famous gardens in Castle town Chōfu. Although temples and shrines can be found in abundance throughout the region, these are some of the most important and most interesting temples and shrines in the Chugoku Region. Izumo Shrine (Izumo) The second holiest Shinto shrine (Ise Shrine in Ise being number one) and certainly one o the most impressive in Japan Izumo Shrine is dedicated to the god of marriage and happiness. Itsukushima Shrine (Miyajima) As Japan's most photographed shrine, one of the top three views in Japan, and a UNESCO World Heritage Site Itsukushima Shrine is highly valued for its spiritual, cultural, and historical significance and has the credentials to prove it. Saijo Inari (Okayama) Considered to be one of Japan's three great Inari shrines, Saijo Inari is sometimes referred to as a temple, because of its interesting combination of Buddhist and Shinto elements. Mitokusan Nageiredo (Misasa) A cliff-side temple that one has been able to determine how it was constructed. Hofu Tenmangu (Hofu) One of the Three Great Tenjin Shrines of Japan, it's a popular place to view plum blossoms. Kozan-ji (Shimonoseki) It is a national treasure, founded in 1327. Sumiyoshi Shrine (Shimonoseki) It is a national treasurenational treasure. There are many great museums in the region, and every prefecture has its own Prefectural Museum and Prefectural Art Museum that are worth visiting, but the following are some of the more unique and famous museums in the region. Ohara Museum of Art (Kurashiki) This museum has an impressive collection of Western art that anyone with even minimal knowledge about art should be able to recognize most of the artists. Although the European artwork is the museum's claim to fame, it also houses modern Japanese art and ancient Chinese artifacts in separate buildings of the museum grounds. Atomic Bomb Memorial Museum (Hiroshima) As one of only two cities to have ever been hit by an atomic bomb, this museum was built to educate people about the effects of atomic warfare on cities, objects, and of the greatest interest, people. The museums is well-designed and highly educational; a must-see for anyone travelling within the region. Okayama Orient Museum (Okayama) An interesting little museum filled with artifacts from the ancient cultures of the Middle East. Tsuyama Archives of Western Learning (Tsuyama) One of the few museums dedicated to the teaching of Western learning and Japan's earliest interactions with the West. Seto Inland Sea Visible from Okayama, Hiroshima, and Yamaguchi, the Seto Inland Sea contains many islands and the famous Seto Ohashi Bridge. Mount Daisen (Daisen) The highest mountain in Western Japan, often referred to as the Fuji of the West. Taishakukyo Gorge (Shobara) A scenic gorge containing Lake Shinyu and Onbashi, one of the largest natural bridges in the world. Chugoku 33 Kannon Temple Pilgrimage (中国三十三観音霊場) A pilgrimage through each prefecture in the region to see historic Kannon temples. Famous dishes from the Chugoku region. The region has the perfect climate for growing fruit, so the region is naturally famous throughout the nation for its delicious fruits. Daisen Water (Daisen) The water from Mount Daisen has been bottled by Suntory, as well as Coke, and can be purchased throughout Japan in stores and vending machines. Hire-Sake (Shimonoseki) Sake produced with blowfish (fugu) fins. Maboroshi (Takehara) Popular wine from Hiroshima prefecture. Okayama Sake (Okayama) Famous for both Asahimai and Kibi no hana sake. Legend of Yamaguchi (Yamaguchi) The specialty of Yamaguchi City. Shikoku - Japan's oft-ignored fourth island is easily accessed from the southern coast of Chugoku. Kyushu - Home to the bustling city of Fukuoka, historical Nagasaki, relaxing Beppu, and a variety of natural sites, such as Aso. Kansai - With the ancient capitals of Kyoto and Nara and the large metropolis that is Osaka, this area offers visitors an endless number of cultural and historical sites, along with great shopping and nightlife. This page was last edited on 25 August 2015, at 01:55.